Astronomers know that while large stars can end their lives as violently cataclysmic supernovae, smaller stars end up as planetary nebulae – colorful, glowing clouds of dust and gas. In recent decades these nebulae, once thought to be mostly spherical, have been observed to often emit powerful, bipolar jets of gas and dust. But how do spherical stars evolve to produce highly aspherical planetary nebulae? For the jets in the nebulae to form, the spherical AGB stars have to somehow become non-spherical and Blackman says that astronomers believe this occurs because AGB stars are not single stars but part of a binary system. The jets are thought to be produced by the ejection of material that is first pulled and acquired, or “accreted,” from one object to the other and swirled into a so-called accretion disk. There are, however, a range of different scenarios for the production of these accretion disks. All these scenarios involve two stars or a star and a massive planet, but it has been hard to rule any of them out until now because the “core” of the AGBs, where the disks form, are too small to be directly resolved by telescopes. Blackman and his student, Scott Lucchini, wanted to determine whether the binaries can be widely separated and weakly interacting, or whether they must be close and strongly interacting. They found that only two types of accretion models, both of which involve the most strongly interacting binaries, could create these jetted pre-planetary nebulae. In the first type of model, the “Roche lobe overflow,” the companions are so close that the AGB stellar envelope gets pulled into a disk around the companion. In the second type of models, or “common envelope” models, the companion is even closer and fully enters the envelope of the AGB star so that the two objects have a “common” envelope. From within the common envelope, very high accretion rate disks can either form around the companion from the AGB star material, or the companion can be shredded into a disk around the AGB star core. Both of these scenarios could provide enough energy and momentum to produce the jets that have been observed. The name planetary nebulae originally came from astronomer William Herschel, who first observed them in the 1780s, and thought they were newly forming gaseous planets. Although the name has persisted, now we know that they are in fact the end states of low mass stars, and would only involve planets if a binary companion in one of the accretion scenarios above were in fact a large planet. “Pre-planetary” and “planetary” nebulae are different in the nature of the light they produce; pre-planetary nebulae reflect light, whereas mature planetary nebulae shine through ionization (where atoms lose or gain electrons). Pre-planetary nebulae shoot out two jets of gas and dust, the latter forming in the jets as the outflows expand and cool. This dust reflects the light produced by the hotter core. 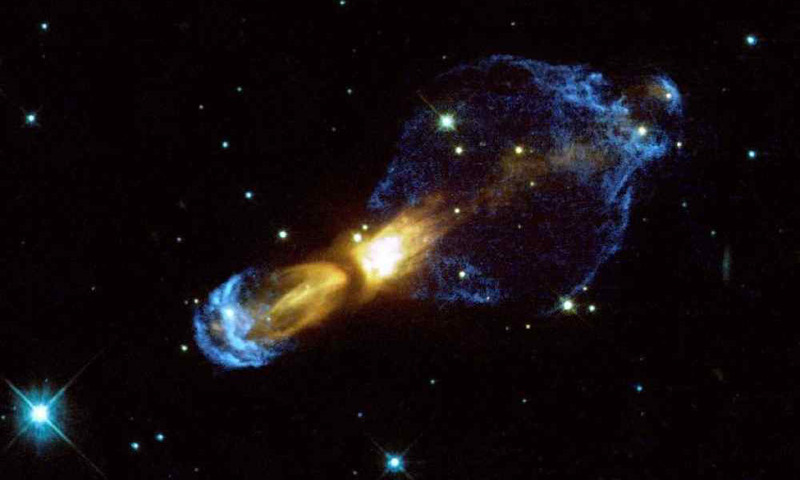 In planetary nebulae, thought to be the evolved stage of pre-planetary nebula, the core is exposed and the hotter radiation it emits ionizes the gas in the now weaker jets, which in turn glow. The new work appears in “Using kinematic properties of pre-planetary nebulae to constrain engine paradigms”, Eric G. Blackman and Scott Luchini, Monthly Notices of the Royal Astronomical Society, Oxford University Press. The paper is available from http://mnras.oxfordjournals.org/lookup/doi/10.1093/mnrasl/slu001. A preprint of the paper is available from http://arxiv.org/pdf/1312.5372.pdf.